With Jaroslav Halak’s demotion to the American Hockey League and the surprise hot streaks of Anders Lee and Andrew Ladd, the New York Islanders ended 2016 in seventh place in the Metropolitan Division. There’s little to be excited about for a team with a 15-15-6 through 36 games, though. However, with 46 games left to play, the Islanders have an opportunity to be more than spoilers. Don’t let anyone fool you, this team still has control of its own destiny. In order for the Islanders to get back to the 100-point mark and the playoffs for a third consecutive season, they’ll need to win 32 of their last 46 games. With those 32 wins over the last half of the season, the Islanders would end the 2016-17 season with a 47-29-6 record. Is it impossible? No, but highly unlikely. That 100-point total is more of a magic number. Good teams have hit the 90 or even 95-point mark in the past and not made the playoffs. Nabbing 100-points and not making the playoffs is little more unfathomable. Add injuries, luck and everything else that can happen over the course of a season and anything is possible. Including the Islanders making the playoffs. Regardless of how the teams ahead of them are playing right now, the Islanders, for perhaps the first time this season, have their ducks in a row. Regardless, they’ll still need a few variables to go their way to get this season to end magically. Anders Lee is now playing with John Tavares and Josh Bailey, so there’s no need to worry about his production, but the rise of Ladd, Nikolay Kulemin and Ryan Strome has come at exactly the right time. A few weeks ago, the Isles were in the bottom third in scoring and now find themselves in the top half of the league. Signed to a seven-year deal this offseason, Ladd was brought in to score 25-30 goals. He’s only been that type of player over the last two weeks. Kulemin and Strome shouldn’t be counted on for that type of goal-scoring, but Kulemin has been dangerously strong on the puck and Strome is simply shooting more. 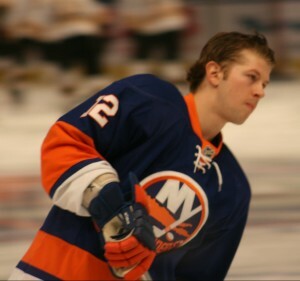 With Brock Nelson’s continued steady play as well, the Islanders have weapons for the first time this season. Backup goaltender J.F. Berube will become an unrestricted free agent (UFA) if he doesn’t play in at least 28 games, given his age (25) and contract status. The bottom line on that matter is, who cares. The way the Islanders have treated him and with so much depth at goaltender in the NHL, the Islanders can find someone else to back up Greiss — or whoever is in net for New York next season. Ilya Sorokin is in the wings as well, so the Islanders’ goaltending situation is a lot better than anyone thinks right now. 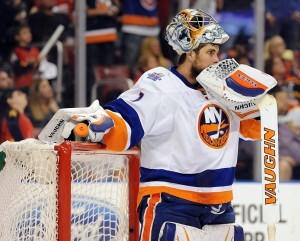 With Halak in Bridgeport, Greiss can now take this team and put it on his back the same way he did last season. He is one of the few Islanders who hasn’t been a complete disappointment, as his save percentage and goals-against average are incredibly similar to last year. Will the Real JT Please Stand up? John Tavares is better than 27 points in 36 games. The Islanders captain needs to get back to a point a game, regardless of who’s on his wing. He’s the guy that this team depends on to score and for that reason, he’s got to turn it up. The fact that Josh Bailey and Brock Nelson are a good game away from leading the Islanders in scoring is a scary thought. If the Islanders don’t make the postseason this year, you can bet Tavares’ point totals will end up lower than last year.